1. Bring water, milk, oil and salt to boil. 2. Remove the pan from heat and add the tapioca starch. Mix well with a wooden spoon and let it cool down slightly. 3. Start preheating the oven to 375F and line a baking sheet with parchment paper. 4. Add the egg to the dough and knead. I used a stand mixer with a dough hook attachment for that. 2-3 minutes was enough. 6. Grease your hands with oil so that the dough does not stick. Roll walnut-sized balls and place them on the baking sheet. 7. Bake the puffs for about 30-40 minutes until puffed and golden. - Wonderful puffs! A little crunchy on the outside, gooey and chewy inside. We ate them instead of bread with lunch, but they would make a perfect snack or appetizer. 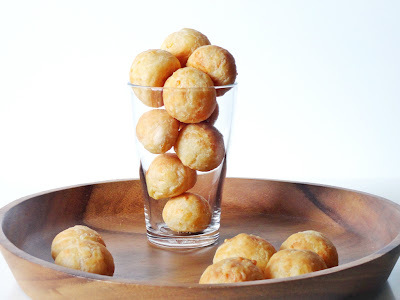 - I saw many recipes with pao de queijo, and tried making them before, but they deflated and collapsed as soon as I took them out of the oven. I think the recipe I had followed did not require boiling the milk first before adding the flour. Probably it also used normal flour. In any case, this recipe worked much better for me. I got the link to it from a very nice Brazilian girl I recently met, and I am very grateful :-). - The original recipe calls for baking the puffs for 20 minutes at 350F. That's what I did, but the puffs were completely row. I ended up baking them for about 50 minutes, increasing the temperature to 380F for the last 15 minutes. Maybe it's my oven, but next time I am going to bake them at 375 for 40 minutes. Maybe I'll reduce the temperature to 350F 20 minutes into baking. - By the way, tapioca flour is gluten free, so this recipe is gluten-free (and fat-rich ;-) with all the cheese and oil). Wow! I've never tried cheesy puffs before but I can totally imagine how wonderful these are. The best part is that it's oven baked, not deep fried. What a great snack! I believe the translation is Cheese-Bread.